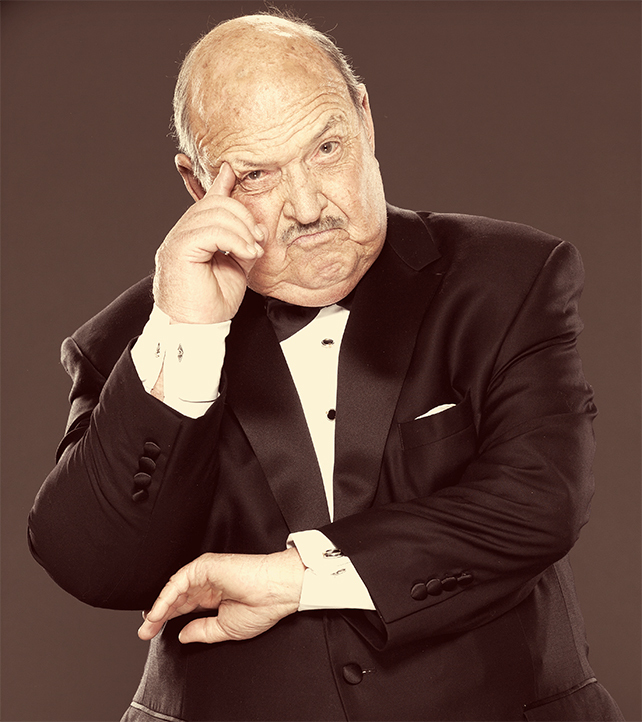 Check out Gene Okerlund’s WWE Alumni profile here! Gene Okerlund’s career began in the American Wrestling Association in the early 1970s filling in for an absent announcer. Gene Okerlund was given the moniker “Mean” Gene by AWA alumni Jesse “the Body” Ventura. 1984: Vince McMahon Jr raided the AWA signed up such names as Mean Gene, Hulk Hogan, Jesse Ventura and Bobby Heenan. Mean Gene’s role increased dramatically and became one of the most recognizable faces (and voices) in wrestling. March 31, 1985 – WrestleMania I: Mean Gene Okerlund sang the Star Spangled Banner! Mean Gene once teamed with Hulk Hogan to defeat Mr. Fuji and George “The Animal” Steele in Madison Square Garden. Mean Gene hosted many WWF Madison Square Garden cards alongside the late Gorilla Monsoon. Mean Gene also hosted WWF TV programs such as WWF All American Wrestling with Bobby Heenan. Mean Gene also hosted numerous WWF Coliseum Home Video tapes. Mean Gene was most often seen on a WWF Superstars of Wrestling segments the “Event Center” and “Update”. Mean Gene formed a strong on-air partnership with both Bobby Heenan and Gorilla Monsoon, who became close personal friends. SummerSlam 1993: Mean Gene Okerlund’s last pay per view with the company and is phased out and replaced by Joe Fowler. Mean Gene jumped to World Championship Wrestling after nine long years in the WWF. September 1993: Mean Gene debut in WCW and is immediately pushed as WCWs top interviewer. Mean Gene hosted the WCW Hotline every week and delivered plugs (teasers) during every WCW Television program. 1999: Mean Gene aligned himself with the Millionaires Club and feuded with fellow interiewer Pamela Paulshock of the New Blood. 2000: Mean Gene started a feud with new Nitro announcer Mark Madden, and even has a match with him on Nitro. August 9, 2000 – Thunder: Buff Bagwell and Gene Okerlund defeated Mark Madden and Positively Kanyon. August 16, 2000 – Thunder: Gene Okerlund defeated Mark Madden in a street fight. Mean Gene remained with WCW until it was sold to Vince McMahon and the WWFe. WrestleMania X-7: Mean Gene Okerlund & Bobby Heenan made appearances as guest commentators for the Gimmick Battle Royal. May 2002: Mean Gene Okerlund returns to the WWE to host it’s new show WWE Confidential. March 2003: Mean Gene renewed his contract expanding his duties from Confidential to again becoming a backstage interviewer. March 2004: Mean Gene Okerlund hosts the WWE’s 2004 Hall of Fame Ceremony in New York City. September 2004: Mean Gene Okerlund is in dire need of a kidney donation. ~~~UPDATE: Gene Okerlund’s operation is a success. 2005: Mean Gene Okerlund hosts WWE 24/7’s Hall of Fame program. April 2, 2005 – Hall of Fame Ceremony: Mean Gene Okerlund hosted the 2005 Hall of Fame ceremony in Los Angeles, California. April 3, 2005 – WrestleMania XXI: Mean Gene Okerlund introduced the 2005 Hall of Fame Iductees to the live crowd. April 25, 2005 – RAW: Mean Gene interviews Shawn Michaels & Hulk Hogan about their upcoming tag match on PPV. October 3, 2005 – WWE Homecoming: Mean Gene Okerland interviewed Hulk Hogan in the ring as Hogan challenged Steve Austin! February 27, 2006 – RAW: They announced that Mean Gene Okerland would be inducted into the WWE Hall of Fame on April 1. April 1, 2006: Mean Gene Okerland was officially inducted into the WWE Hall of Fame by his buddy Hulk Hogan..
June 11, 2007 – Vince McMahon Appreciation Night: Mean Gene Okerland made unscripted comments on Mr. McMahon. ~~~Later that night: Mr. Vince McMahon exited the building and got into his private limousine just before it exploded into flames! April 4, 2009 – WWE Hall of Fame: Howard Finkel was officially inducted into the WWE Hall of Fame by Mean Gene Okerland!. March 28, 2010 – WrestleMania 26: Mean Gene had a brief cameo doing a comedy sketch with Santino Marella plugging Slim Jim! June 7, 2010 – WWE Viewer’s Choice: Mean Gene Okerland made a brief cameo for a backstage skit and he was hilarious as usual. November 15, 2010 – WWE : Mean Gene Okerland returned to reprise his role as on stage interviewer for a special “Old School RAW”. April 10, 2012 – SmackDown: World Heavyweight Champion Sheamus and Mean Gene Okerlund defeated Daniel Bryan and Alberto Del Rio. January 2, 2019: WWE.com has announced the passing of Mean Gene Okerlund at the age of 76.